Availability: There’s a place available on each session. Contact me if you’re interested in coming. Materials: If you have them, please bring willow charcoal, chalk and A3 pastel-type paper. Pen, pencil and cartridge paper would also be suitable. 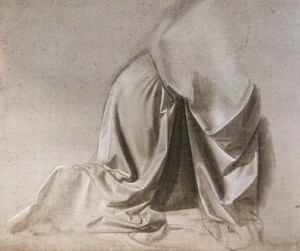 In this session we shall draw draped fabric, exploring ways to show form, tone, texture and the hanging weight of it. We shall refer to drapery studies by artists inculding Leonardo da Vinci and Durer. Places are limited, so please get in touch to reserve your spot.